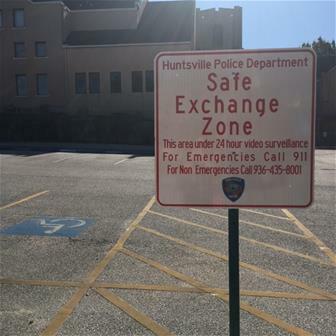 To further serve the citizens of Huntsville, The Huntsville Police Department is offering a Safe Exchange Zone. Persons who are selling or buying items through the internet, classified ads, or other media are invited to meet in the parking lot of the Huntsville Police Department to make their exchange safely. The Safe Exchange Zone may also be utilized for child custody exchanges. There is a designated location near the entrance to the Police Department that is marked by both sign and markings on the pavement. The location is under video surveillance at all times. If available, officers may stand by with the persons making the exchange to further ensure the safety of the participants as well as to determine if items being sold have been listed as stolen. HPD further advised that officers are not able to facilitate any transaction, nor will they interfere or advise on the validity of any purchase or sale of any items. The presence of Huntsville Police Department personnel is solely intended for the physical safety of the involved parties.